Over the next couple of weeks, I'll be transcribing accounts of two family vacations from old carbon copies I've had 'forever'. One, an account of an Alaska cruise in 1954, was written by my Na, my maternal grandmother, Amy Estella Irwin (married name: Scott) and typed up, I'm pretty sure, by my mum, or possibly, Dad. Here is a bit of her account (un-expurgated). She begins by describing her sister's 'Gay 90s' outfit, then. Second prize went to a lady in a rain coat with a lighted coal oil lantern. Her placard read "Passenger on S.S. Pr. George looking for the midnight sun, or in fact any sun." This is how I remember my Na, social, inventive and very fond of a (clean) joke, especially one involving words. If you have a connection to any of these people, would love to hear from you. Amanuensis Monday was started by John Newmark of the Transylvanian Dutch blog to encourage more transcribing of family and family related documents. 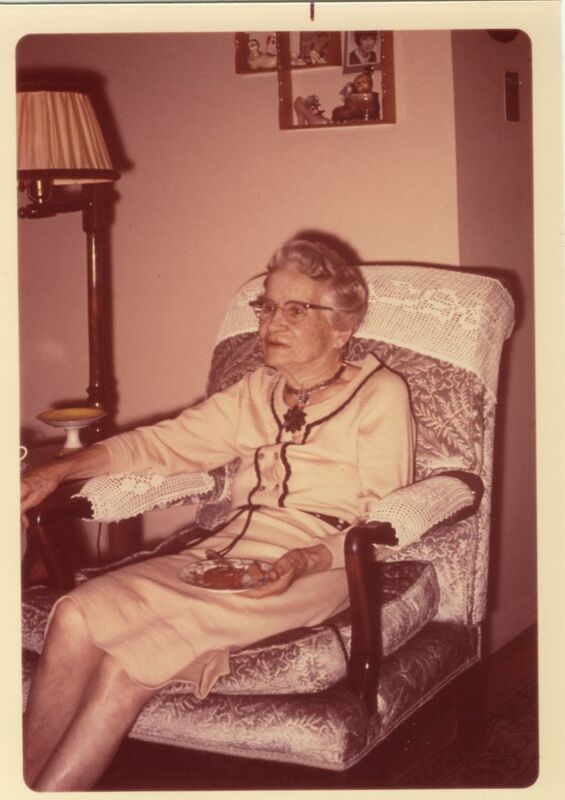 Click to read his this month's contribution from a recollection of Tecumseh, 1813.
née Irwin, at her birthday celebration at her apartment in Vancouver, BC, 1971.